To Dog With Love: One Lucky Dog Will Win a Three-Month Supply of SmartBones! One Lucky Dog Will Win a Three-Month Supply of SmartBones! Cosmo says his SmartBone is paw lickin' good! Hot dog! We have a giveaway today we wish we could win! 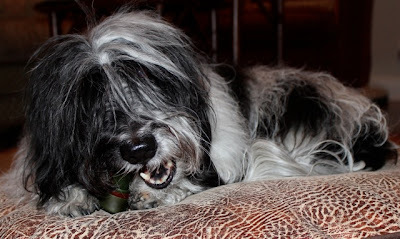 Last year, Cosmo helped review and give away SmartBones, the easy to digest, rawhide-free dog chew. And today, the folks at SmartBones have provided us with a three-month supply to give away! That's a lot of good chews! One lucky U.S. winner will win SIX BAGS of SmartBones in the appropriate size! Entries must be posted by 11:59 p.m. ET on February 12, 2012. Cosmo's willing to share his SmartBones enjoyment! Leave a comment on this blog post telling us you want to win a THREE-MONTH SUPPLY of SmartBones! Cooper-My husky/springer mix would LOVE a supply of these wonderful SmartBones ! I want to win a 3 month supply of smart bones!!!!!! I'm really interested in trying these bones! My dog Buster is a sweetheart who loves his bones (that wasn't always the case, when we first gave him his first bone he was so scared of it he peed! lol). Lately he's been eating his rawhides so fast that he forgets to breathe and is all out of breathe, I worry that he's not chewing them enough and isn't properly digesting the bones. Smartbones sound like they would be a much healthier option for my crazy 1 year old pup. Thanks for offering this great giveaway! (Mroxie13) My golden retriever mix Cinderella would love a 3 month supply of Smartbones. She is crazy for them. As soon as I grab the bag her tail is wagging a mile a minute. Out of all the treats I buy her I must say these are her favs!!!! I hope we win because she will be the happiest dog on the block for 3 months!!! My 4 goldens would love to have a 3 month supply of yummy treats. They receive treats for being good babies while we are at school and work. They get a treat every day for the last 9 years. Josie, Ranger, and Bear, my three rat pins would love to fight... I mean share the 3 month supply of smartbones!! Thank you for the opportunity to enter! Just found these at my vets last week, I was so excited because my guys love rawhide but we don't allow them to have it. Bought these up and came home with a big surprise!! they love them and can't wait to get some more. A 3 month supply would have their tails spinning like a propeller! Bruiser and Shenzi say thanks for the great treats!! My mini dachshund Sidney LOVES to chew and would love to win a three month supply of Smartbones!! Thank you!! I have 5 dogs and they would love to share these bones, I have 2 Bichons and 3 Maltese. With four dogs, a three month supply would be wonderful! All my girls love a good treat! Following Cosmo Havanese on Twitter! My Gabbie (border collie mix) would love it if she won. this is her (and her sister's) birthday month and i am giving her a birthday party. this would be the best doggie bag gift to give to her doggie friends. she has had SmartBones before and just LOVES them! Tweeted the giveaway! Thanks so much! Belle and Rufus would love a 3 month supply of Smart Bones!! Great giveaway! Good luck to everyone! We are in Canada so we'll route for everyone else! 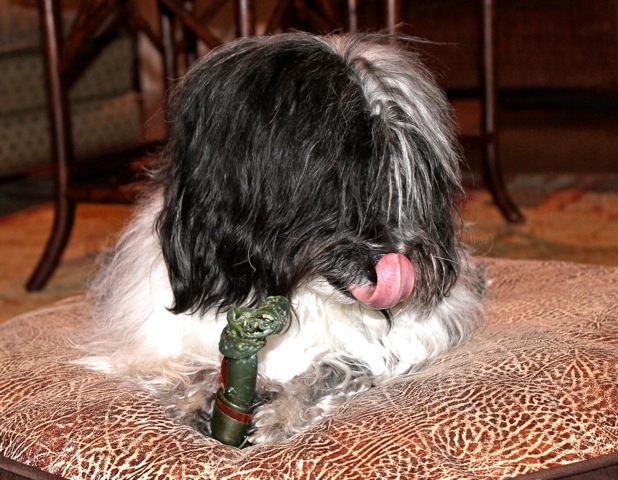 My 10 pound Havanese, Romeo, would love to win a three month supply of Smart Bones. I would like to win the SmartBones because I love to spoil my Frankie with the best treats! I would love to win SmartBones because my dog Achilles a chihuahua loves them and he only gets them once in a while. I would love to spoil him because I love that tail when it wags. and he's never had a bone to chew on before haha! My german shepherd has always loved these bones. Would be nice to give him more treats lately. My wife lost her job now im the only one working and were struggling to make it. Kinda hard to buy treats with a limited income. It's my birthday month....woof woof! I would ruv some doggy treats for a gift.....woof woof!!! I want to win a THREE-MONTH SUPPLY of SmartBones! I Like To Dog With Love on Facebook as Kelly Ann T.
I follow you on GFC as cstironkat. I Follow Cosmo Havanese on Twitter as cstironkat. My dogs LOVE treats ,that's why they want to win. I would like to win your dog treats for my two dogs. I have tweeted this offer. I 'like' To Dog With Love. I want to win a 3-month supply of SmartBones!!! I like To Dog With Love on Facebook! I follow Cosmo Havanese on Twitter! I joined To Dog With Love using Google Friend Connect! I would love to win a 3-month supply of SmartBones for the dogs! I follow Cosmo Havanese on Twitter as ShellChis. Walker says he would like a 3-month supply of SmartBones!! !